I didn’t get to have Ana early on in my pregnancy…we met when I was already at 36 weeks, however I know she would have been wonderful to have from the start. My husband and I had a lot of ideas about how we wanted the birth of our twins to go, but weren’t sure what was viable at that point and were feeling pressured from the Drs, other parents, family, and strangers. Ana was able to help us sift through all of our thoughts and create a solid plan. 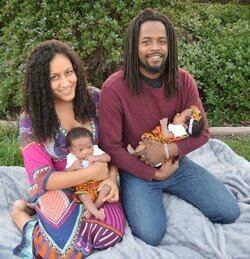 When my son was breech, she helped me find holistic remedies and experts in the community to help him turn, and later when I wanted to keep my babies in until my official due date, Ana supported my decision. When it was time to deliver, she somehow became even more amazing! My labor was long and she spent tons of time with me at my home and then the hospital. Her foot rubs were amazing and her help was so calm and relaxing. The day I gave birth she had to have had 3 hours of sleep and yet she was alert and available as though fresh and well rested. My delivery was very fast and easy once active labor began because I was so relaxed. And I give credit for that to Ana for setting up a small community around me of people who believed in us and my family’s wants and needs. I wouldn’t have wanted anyone else to have helped with my son while I was taken to the OR to have my c-section for my daughter. I am so grateful Ana was a part of my pregnancy and I have so much love and respect for her and what she and other doulas do. Ana has been a great support since the day we decided to hire a doula. Ana was kind enough to meet with us several times for our prenatal meetings. She had my husband and I try various relaxation techniques and helped us go over what my birth plans were. I had to go to hospital because I found out my water was leaking during my appointment with the doctor. When I was admitted, Ana was able to help me start my labor by trying acupressure points, so I didn't need to use Pitocin, which had been ordered by my doctor. During active labor, Ana was very supportive to both me and my husband. I met Ana through the Santa Cruz Organic Birth Collective. From the start, I knew I wanted her as my doula. She was gentle and kind, but very knowledgeable in pregnancy and birth. I didn't think I'd be able to have a doula due to financial situations, but Ana worked with us. I didn't meet her until I was 8 months pregnant and she gave me a book to read about labor and natural birth. (She has many books and DVDs you can borrow to become educated with the birthing process.) I felt so much more comfortable about labor and birth after talking with Ana, learning relaxing techniques to do with my husband and watching a movie on Netflix that she recommended. Ana Hernandez served as my doula for a sliding scale price with the scholarship program that she and Organic birth Santa Cruz wonderfully provide for women and families who are in need of a doula but are unable to pay full price. Ana is a wonderful doula and person who is very caring, calm, knowledgeable, easy going and very helpful. She provided pre and post natal services and education. She came to our residence and gave us lots of knowledge about natural birth, including lending us books and DVDs, and even showed and helped us with positioning and exercises on several occasions. She gave me contacts for other helpful resources, such as chiropractic work. Ana gave us lots of tools to work with, helped me along with my birth plan and also came to 2 prenatal appointments.